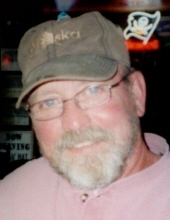 Dennis L. Aichholz, Age 68, passed away peacefully at home surrounded by his family after a short battle with cancer. He was born in 1950 to Darl and Wanda (Swick) Aichholz. Survivors include Sandy (Corthell), his wife of 44 years, a son Matthew (Shane) of Bay View and a daughter Kelli (Bill) Jones of Tiffin, one grandson, Noah Jones and one granddaughter, Alexandria Jones, a brother, Steve (Karen) Aichholz, a sister-in-law, Kim Illig and a brother-in-law, Randy Corthell. Nephews: Craig (Alexia) Illig, Kyle Illig, Chris (Jena) Aichholz. Nieces: Carah (Nick) Weber, Sara Aichholz. He was preceded in death by his parents and mother and father-in-law Walter and Coletta Corthell. Denny graduated from Attica High School in 1969 and served in the Navy during the Vietnam War. He was a member of Izaak Walton and a Mason. He worked as a welder for nine years at the Green Springs Gas Plant. For the next 33 years he owned and operated his own plumbing and heating business. (Aichholz Plumbing and Heating) He was proud and happy that his nephew Craig took over and continued his business and enjoyed helping him even after he “Retired”. He loved traveling and going on vacations with his wife and friends. He loved going to Canada fishing, bear hunting, and elk hunting out west. He also enjoyed cutting wood, gardening and playing cards. But, most of all he loved his kids and his two very special grandkids and spending time with them. They were the love of his life, along with his Newfoundland (Bear). He will be deeply missed by family and friends. Funeral services for Dennis will begin at 11:00 a.m., Wednesday, February 6, 2019, at Pleasant Ridge United Methodist Church with Pastor Gary Hicks officiating. Burial will follow the services on Wednesday, at the Pleasant Ridge cemetery. Visitation for family and friends will be held on Tuesday, February 5, 2019 from 2-4 and 6-8 p.m. at the Lindsey-Shook Funeral Home, 3085 S. SR. 19 Bloomville. Memorials can be made to Community Hospice or Pleasant Ridge United Methodist Church. To send flowers or a remembrance gift to the family of Dennis L. Aichholz, please visit our Tribute Store. "Email Address" would like to share the life celebration of Dennis L. Aichholz. Click on the "link" to go to share a favorite memory or leave a condolence message for the family.